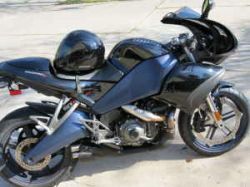 The 2008 Buell 1125 R for Sale is located in Hickory Creek Texas and full financing is available for this motorcycle. It has only 2007 miles logged on the odometer so this bike won't last long. For 2008 Buell 1125 R specs, you can check out the information provided by Buell.com to see what you get for $12,000.00! If you are interested please leave your questions and contact information in the space below provided by Strike Lightning Used Motorcycles for Sale and I will get back with you as soon as possible. Strike Lightning would also encourage bikers to submit a review of the 2008 Buell 1125 R for Sale to help potential buyers make informed decisions and to benefit the biker community as a whole.